TB treatment for children is fundamentally the same as for adults, with a combination of TB drugs needing to be taken for a number of months. TB treatment for children consists of an intensive phase followed by a continuation phase. The purpose of the intensive phase is to rapidly eliminate the majority of the TB bacteria, and this phase uses a greater number of TB drugs than the continuation phase whose aim is to eradicate any remaining dormant bacteria. When started promptly the outcome of TB treatment in children is generally good, even in those children that are very young and who have compromised immune systems. There must be a continuous supply of quality assured TB drugs. As children approach a body weight of 25kg, adult dosages can be used. 2) In some settings, for example where the prevalence of HIV is high, or where resistance to Isoniazid is high, or both, children should be treated with a four drug regime (HRZE) for 2 months, followed by a 2 drug regime (HR) for four months at the above dosages. Young children who are unable, or unwilling to swallow large number of tablets each day need child friendly formulations to treat their TB. Ideally these should be in solid fixed dose combination (FDC) forms that are then dispersible in liquids, and can easily provide for dosing across different weight groups. FDCs are when several drugs are combined together with a specific dosage of each drug included in one tablet. FDCs are used not only for TB but also for the management of HIV and Malaria. A major advantage of FDCs is that they improve patient adherence as fewer tablets need to be taken and a single drug cannot be taken on its own. At the same time there appears to be no loss of effectiveness. Although there is still some discussion about the benefit of FDCs for the treatment of TB in adults, there would appear to be little dispute about the benefit of FDCs for the treatment of TB in children. When the new guidance about dosages was released in 2010, many of the currently available FDCs no longer fitted with the recommended doses. This meant that providing treatment for children became a much more complex process. 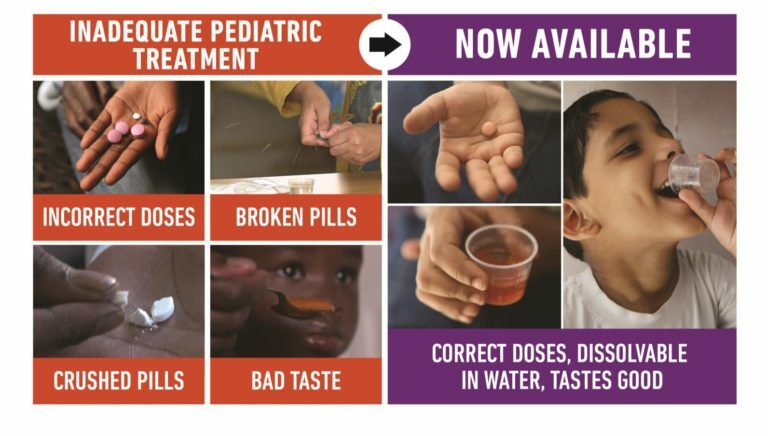 The use of FDCs had to be combined with additional single tablets or divided tablets of individual drugs, in order to achieve the new recommended dose for a child’s weight. Children weighing more than 30 kg should be treated according to the current adult treatment guidelines. “Children with the disease will no longer have to take crushed tablets intended for adult sufferers, meaning that they will get the proper dosage”. “For the first time, we have appropriate treatment for the million children who have tuberculosis, with a formulation of drug that is easy for kids to take, that tastes good and that will hopefully make the disease much easier to treat”. Rifampicin 75mg + Isoniazid 50mg + Pyrazinamide 150mg. 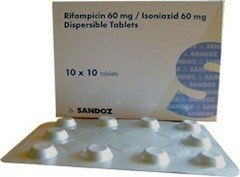 Rifampicin 75mg + Isoniazid 50mg. The dosages of first line anti TB medicines should be those given above, which were first recommended in 2010. So with the new FDCs the following is the number of daily tablets needed to reach the proper dosing based on the child’s weight. Ethambutol should be added to the intensive phase, for children with extensive disease or living in settings where the prevalence of HIV or of isoniazid is high.